You will experience the best of diving with us. Our qualified guides and ultra modern equipment will make your experience a memorable of lifetime. Explore the amazing sea world! Join with us to explore the amazing and colorful life under sea! view from your naked eye! Please use the following form to make a booking. 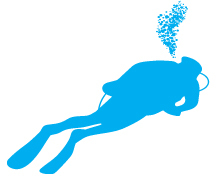 Our well trained and experienced staff use the latest equipment to make your diving experience a good one. The director R.K Somadasa de Silva (or Somey as he is commonly known) is well reputed in the region as a commercial and professional diver. He has over 30 years of experience in the diving industry and is qualified both as a UDI/CMAS instructor and a PADI assistant instructor, with more than 500 foreign students to his credit and innumerable local divers. In addition to teaching, Somey is qualified as a commercial diver and has worked on a number of underwater construction projects, both for private and government institutions. The school is now managed by Somey's beloved son Sachin (Another great diver of course!) who has great implemented plans to improve your diving experience. Obviously Somey is not the only member of staff. The two divemasters, Ishan and Dharshana, are both PADI assistant instructors and have many thousands of dives in their logbooks, having been diving here for over 10 years. Our chief boatman, Sarath, is both certified by the Sri Lanka Port Authority and very experienced on the open seas (we swear he uses natural GPS!). As well as these friendly and experienced fellows we have a number of other dive guides and boatmen, all keen to help you enjoy your dives. As a family run operation, the International Diving School is well known for its welcoming nature and many of our customers return time after time, becoming friends within a few dives. So come diving with Somey and the team at the International Diving School, Hikkaduwa and prepare to dive here again and again.